Taiwan under Qing rule refers to the rule of the Qing dynasty over Formosa (modern-day Taiwan) from 1683 to 1895. The Qing court sent an army led by general Shi Lang and annexed Taiwan in 1683. It was governed as Taiwan Prefecture of Fokien Province (Fujian) until the declaration of Fokien-Taiwan Province in 1887. Qing rule over Taiwan ended when Taiwan was ceded to Japan by the Treaty of Shimonoseki in 1895. The Qing Empire in 1820, with provinces in yellow, military governorates and protectorates in light yellow, tributary states in orange. Following the death of Zheng Jing in 1681, the Qing dynasty seized the advantage presented by the struggle for succession and dispatched their navy with Shi Lang at its head to destroy the Zheng fleet off the Penghu Islands. In 1683 following the Battle of Penghu, Qing troops landed in Taiwan. Zheng Keshuang gave in to Qing demands for surrender, and his Kingdom of Tungning was incorporated into the Qing Empire as part of Fujian Province, thereby ending two decades of rule by the Zheng family. The Kangxi Emperor of the Qing dynasty annexed Taiwan to remove any threat to his dynasty from remaining resistance forces on the island. However, Qing authorities did not want to develop Taiwan over aggressively as this might have encouraged potential resistances force to build a base there. Accordingly, the early Qing dynasty initially ruled Taiwan passively as part of Fujian, until work began to create a separate province in 1885. In 1721, a Hokkien-Hakka rebellion led by Zhu Yigui captured Taiwan-fu (modern-day Tainan) and briefly established a government reminiscent of the Ming dynasty (see Southern Ming). In the immediate aftermath of Zhu Yigui rebellion, the desire to open up new land for cultivation saw government encouraging the expansion of Han Chinese migration to other areas of the island. For instance, the population in the Tamsui area had grown to the point where the government needed an administrative centre there, in addition to a military outpost. The government tried to build a centre with local aboriginal corvée labor, but treated them more like slaves and finally provoked an uprising. Aboriginal groups split their loyalties —most joined the uprising; some remained loyal to the Qing, perhaps because they had pre-existing feuds with the other groups. The aboriginal revolt was put down within a few months with the arrival of additional troops. The Lin Shuangwen rebellion occurred in 1787–1788. Lin, who was an immigrant from Zhangzhou, had come to Taiwan with his father in the 1770s. He was involved in the secret Heaven and Earth Society whose origins are not clear. Lin's father was detained by the local authorities, perhaps in suspicion of his activities with the society; Lin Shuangwen then organized the rest of the society members in a revolt in an attempt to free his father. There was initial success in pushing government forces out of Lin's home base in Changhua; his allies did likewise in Tamsui. By this point, the fighting was drawing in Zhangzhou people beyond just the society members, and activating the old feuds; this brought out Quanzhou networks (as well as Hakka) on behalf of the government. 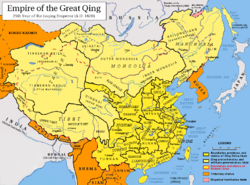 Eventually, the government sent sufficient force to restore order; Lin Shuangwen was executed and the Heaven and Earth Society was dispersed to mainland China or sent into hiding, but there was no way to eliminate ill-will between Zhangzhou, Quanzhou, and Hakka networks. Though they never again were serious to push out the government or encompass the whole island, feuds went on sporadically for most of the 19th century, only started coming to an end in the 1860s. There were more than a hundred rebellions during the early Qing. The frequency of rebellions, riots, and civil strife in Qing Taiwan is evoked by the common saying "every three years an uprising; every five years a rebellion" (三年一反、五年一亂). The Aboriginals often slaughtered the shipwrecked crews of western ships. In 1867 the entire American crew of the Rover were massacred by aboriginals in the Rover incident. When the Americans launched the punitive Formosa Expedition in retaliation, the aboriginals defeated the Americans and forced them to retreat, killing an American marine while suffering no casualties themselves. In the Mudan Incident (1871), Aboriginals slaughtered 54 Ryukyuan sailors which led to the Japanese invasion of Taiwan (1874) against the Aboriginals. The waters around Taiwan (Formosa) were pirate infested. During the Sino-French War (1884-1885) the French attempted an invasion of Taiwan during the Keelung Campaign. Liu Mingchuan, who was leading the defence of Taiwan, recruited Aboriginals to serve alongside the Chinese government soldiers and Hakka militia in fighting against the French. The French were defeated at the Battle of Tamsui and the Qing forces pinned the French down at Keelung in an eight-month-long campaign before the French withdrew. The Hakka used their privately owned muskets instead of modern western rifles. Qing had three main policies relating to the governance of Taiwan. The first policy was to restrict the qualification and number of migrants who were allowed to cross the Taiwan strait and settle in Taiwan. This was to prevent a rapid growth in population. The second policy was to restrict Han Chinese from entering the mountain area which was mainly settled by Indigenous Taiwanese peoples. This policy was to prevent conflict between the two groups. The third was to apply different tax policies for Han immigrants and aboriginal people. The colonial government first sold farming rights of land to urban businessmen, and then these rights-owners would rent out portions of the land to individual farm laborers from the mainland. Because of the high population from Fujian Province, demand for land was high, and therefore rents were also high and migrant laborers usually didn't make much profit. For aboriginal groups, tax farmers were used. The government recognized aboriginal rights to land, but per-village tax was also imposed. The tax was not paid directly, but by merchants who were buying the right to collect taxes for themselves. The tax farmers, and their interpreters and foremen, were known to be corrupt and commit abuses, especially against Aborigines. Besides, corvée labor was included. The result seemed good, since the tax policies made convenient revenue for the government, landowners, tax farmers, yet Han and aboriginal people were struggling. The Taiwanese Plains Aborigines adopted Han customs. Despite the restrictions, the population of Han Chinese in Taiwan grew rapidly from 100,000 to 2,500,000, while the population of Taiwanese Aborigines shrank. The restrictions on mainland Chinese residents migrating to Taiwan stipulated that no family members could accompany the migrant. Therefore, most migrants were mostly single men or married men with wives remaining on mainland China. Most early male migrants to Taiwan would choose to marry the indigenous women. Accordingly, there was a saying which stated that "there were Tangshan (Chinese) men, but no Tangshan women" (Chinese: 有唐山公，無唐山媽; Pe̍h-ōe-jī: Ū Tn̂g-soaⁿ kong, bô Tn̂g-soaⁿ má). The Han people frequently occupied the indigenous land or conducted illegal business with the indigenous peoples, so conflicts often happened. During that time, the Qing government was not interested in managing this matter. It simply drew the borders and closed up the mountain area so they could segregate the two groups. It also implemented a policy which assumed that the indigenous peoples would understand the law as much as the Han Chinese, so when conflicts arose the indigenous peoples tended to be judged unfairly. Accordingly, indigenous land were often taken through both legal and illegal methods, sometimes the Han Chinese even used inter-marriage as an excuse to occupy land. Many people crossed the maintain borders to farm and to conduct business, and conflicts frequently arose. Around 1890, Governor Liu Mingchuan declared that "an aggregate population of 88,000 savages had submitted to Imperial rule." This was only part of a broad action by the Qing government against southern aboriginal tribes in China. The Han people occupied most of the plains and developed good agricultural systems and prosperous commerce, and consequently transformed the plains of Taiwan into a Han-like society. Taiwan had a strong agricultural sector in the economy, while the coastal provinces of mainland China had a strong handcrafting sector, the trade between the two regions prospered and many cities in Taiwan such as Tainan, Lukang and Taipei became important trading ports. After the 1884-1885 Sino-French War, the Qing government realized the strategic importance of Taiwan in relation to trade and geographical location and therefore began to try to rapidly develop Taiwan. In 1887, the island became Taiwan Province, and Liu Mingchuan was appointed as the first governor. Liu increased the administrative regions in Taiwan to tighten control and to reduce crime. He implemented land reform and simplified land management. As a result of the land reform, the taxation received by the government increased by more than threefold. He also developed the mountain area to promote harmony between the Han Chinese and the Indigenous Taiwanese peoples. However, modernization of Taiwan was Liu's main achievement. He encouraged the use of machinery and built military defense infrastructure. He also improved the road and rail systems. In 1887, he started building the first Chinese-built railway (completed in 1893, see Taiwan Railways Administration). In 1888, he opened the first post office in Taiwan (see Chunghwa Post), which was also the first in China. Taiwan was then considered the most developed province in China. However, Liu resigned his post as governor in 1891 and most of the modernization projects initiated by him came to a halt shortly thereafter and were never restarted throughout the rest of the Qing reign over the island. In 1895, Taiwan was ceded to Japan by the Treaty of Shimonoseki. During 50 years, Taiwan is under Japanese rule. Westerners claimed that diseases like leprosy and malaria were present in Taiwan. In an attempt to prevent Japanese rule, an independent democratic Republic of Formosa was declared. This republic was short-lived as the Japanese quickly suppressed opposition. ^ Copper (2000), p. 10. ^ Harris Inwood Martin (1949). The Japanese Demand for Formosa in the Treaty of Shimonoseki, 1895. Stanford Univ. p. 23. ^ Ronald Stone Anderson (1946). Formosa Under the Japanese: A Record of Fifty Years' Occupation ... Stanford University. p. 63. ^ Andrew Jonah Grad (1942). Formosa Today: An Analysis of the Economic Development and Strategic Importance of Japan's Tropical Colony. AMS Press. p. 16. ISBN 978-0-404-59526-5. ^ John Fisher; Antony Best (2011). On the Fringes of Diplomacy: Influences on British Foreign Policy, 1800-1945. Ashgate Publishing, Ltd. pp. 185–. ISBN 978-1-4094-0120-9. ^ Japan Weekly Mail. Jappan Meru Shinbunsha. 1874. pp. 263–. ^ http://www.greendragonsociety.com/Military_History/Taiwan_Formosa_page.htm http://michaelturton.blogspot.com/2010/12/rover-incident-of-1867.html http://michaelturton.blogspot.com/2010_12_01_archive.html "Search Results THE PIRATES OF FORMOSA. - Official Reports of the Engagement of The United States Naval Forces with the Savages of the Isle" (PDF). The New York Times. WASHINGTON. 23 August 1867. "THE PIRATES OF FORMOSA. ; Official Reports of the Engagement of the United States Naval Forces with the Savages of the Isle". The New York Times. 24 August 1867. "EUROPEAN INTELLIGENCE. ; Garibaldi at Sienna Preparing to March Upon Rome Rumored Resignation of Omar Pasha as Turkish Commander in Crete Adjustment of the Difficulties Between Prussia and Denmark Bombardment of the Island of Formosa by American Ships of War CHINA Conflict Between United States Ships-of-War and the Pirates of the Island of Formosa Mexican Dollars Coined During the Reigh of Maximilian Uncurrent ITALY Garibaldi at Sienna Preparing for the Attack on Rome PRUSSIA Prebable Settlement of the Difficulties Between Prussia and Denmark CANDIA Rumored Resignation of Omar Pasha as Commander of the Turkish Forces Who Case of the Ship Anna Kimball Satisfactorily Settied IRELAND Sentence of the Fenian Capt. Moriarty Marine Disaster Attitude of the French and Italian Governments Toward the Garibaldians The Mission of Gen. Dumont from a French Point of View The Interference of France in the Affairs of Schleswig JAVA The Terrible Earthquake in the Island The Approaching Visit of Francis Joseph of Austria--Movements of the Emperor Napo". The New York Times. LONDON. 14 August 1867. "NEWS OF THE DAY. ; EUROPE. GENERAL. LOCAL". The New York Times. 24 August 1867. "The American Fleet in Chinese Waters--Avenging National Insults". The New York Times. 15 August 1867. ^ Japan Gazette. 1873. pp. 73–. ^ "WASHINGTON. ; OFFICIAL DISPATCHES ON THE FORMOSA DIFFICULTY. PARTIAL OCCUPATION OF THE ISLAND BY JAPANESE THE ATTITUDE OF CHINA UNCERTAIN CHARACTER OF THE FORMOSAN BARBARIANS. THE RAILROAD AND THE MAILS. THE VACANT INSPECTOR GENERALSHIP OF STEAMBOATS. THE TREATY OF WASHINGTON. THE CURRENCY BANKS AUTHORIZED CIRCULATION WITHDRAWN. POSTMASTERS APPOINTED. APPOINTMENT OF AN INDIAN COMMISSIONER. THE WRECK OF THE SCOTLAND, NEW-YORK HARBOR. NAVAL ORDERS. TOLL ON VESSELS ENGAGED IN FOREIGN COMMERCE. THE TREASURY SECRET SERVICE. TREASURY BALANCES". The New York Times. WASHINGTON. 18 August 1874. ^ From the London Times (26 November 1858). "The Pirates of the Chinese Seas". The New York Times. From Our Own Correspondent. (29 January 1861). "THE JAPANESE EMBASSY. ; Further Particulars of their Arrival at Yeddo Voyage of the Niagara from Hong-Kong The Last Banquet on Board The Last of Tommy. UNITED STATES STEAM-FRIGATE NIAGARA". The New York Times. "The American Fleet in Chinese Waters--Avenging National Insults". The New York Times. 15 August 1867. ^ Tai (2007), p. 52. ^ Davidson (1903), p. 253: "True, however, to the traditions of his class he permitted no rumor of failure to reach the authorities in Peking. On the contrary, he officially declared (and his declaration was published in the Peking Gazette) that, as a result of his labors, 478 villages with an aggregate population of 88,000 savages had submitted to Imperial rule. Just exactly where the governor found them all is not stated. Even had he included the already conquered and peaceful Pepohoans, who had not been engaged in the warfare described, and could not, therefore, be rightly counted as new subjects, the 478 villages must have stretched his powers of imagination to the utmost." ^ Davidson (1903), p. 244: "During the French war, Liu Ming-chuan had been placed in sole command, responsible only to the central authorities. Under his superintendence, Formosa had been carried safely through the war, and it was now apparent that the exigencies of the times required that the island should be made an independent province, and that officials of high rank and undoubted ability should be henceforth placed in charge of it. Therefore, in 1887, the island was declared by Imperial decree an independent province, and the Imperial Commissioner Liu Ming-chuan was appointed the first governor." ^ Skertchly, S.B.J. (1893). "The Ethnography of Leprosy in the Far East". Proceedings of the Royal Society of Queensland. 13: 14. The two islands of Hainan and Formosa are striking examples of our theme. Hainan is inhabited by a tribe that, keeping to the interior, give but partial submission to the Chinese, and hold scarcely any communication with them. The Chinese proper on the island, are mostly descendants of emigrants from Fokien, and they are leprous, while the natives are free. Formosa was early settled by an Indonesian race, and the island did not become Chinese till 1661. Even now they are confined to the west of the dividing range, and the natives successfully hold the rest. The Chinese are leprous, the Formosans are not. ^ Nitobe, Inazo (1912). "Japan as a Colonizer". The Journal of Race Development. 2 (4): 349. doi:10.2307/29737924. The indigenous population consists of head-hunters of Malay descent, who live in small communities in a very low grade of culture. The only art with which they are acquainted is agriculture, and that in a very primitive style —what the Germans name Spatencultur, not agriculture proper but rather what Mr. Morgan, if I remember rightly, in his Primitive Society calls a primitive form of horticulture. They have no ploughs; they have no draft animals; this horticulture is all that they know. But these people are very cleanly in their habits. This may be due to their Malay instinct of frequent bathing; and they keep their cottages perfectly clean, unlike other savages of a similar grade of culture. The main part of the population, however, consists of Chinese who have come from the continent and settled in Formosa. They came chiefly from the opposite shores, the province of Fukien and from the city and surroundings of Canton. It seems that the Chinese emigrants could not perpetuate their families in their new home for any number of generations, succumbing as they did to the direct and indirect effects of malaria, and hence the Chinese population proper was constantly replenished by new arrivals from the main land. The aborigines or savages living a primitive life, constantly driven into the forest regions and high altitudes, did not increase in numbers; so when Japan assumed authority in this island she found few conditions that bespoke a hopeful outlook. The Chinese, representing two branches of their race totally different in character and in their dialects—their dialect being unintelligible one to the other—occupied the coast and the plains and were chiefly engaged in agricultural pursuits. They had a few fortified cities and towns among them; Tainan and Taihoku, with a population of about 40,000 were the most important. ^ As acting; Fukien-Taiwan Province Civil Affairs Minister. Copper, John F. (2000). Historical dictionary of Taiwan (Republic of China) (2nd ed.). Lanham, Md. [u.a. ]: Scarecrow Press. p. 10. ISBN 9780810836655. OL 39088M. Davidson, James W. (1903). "Chapter XVII: Progressive Formosa: A Province of China. 1886-1894". The Island of Formosa, Past and Present : history, people, resources, and commercial prospects : tea, camphor, sugar, gold, coal, sulphur, economical plants, and other productions. London and New York: Macmillan. OCLC 1887893. OL 6931635M. Tai, Pao-tsun (2007). The Concise History of Taiwan (Chinese-English bilingual ed.). Nantou City: Taiwan Historica. ISBN 9789860109504. Emma Teng (1 March 2006). Taiwan's Imagined Geography: Chinese Colonial Travel Writing and Pictures, 1683-1895. Harvard Univ Asia Center. ISBN 978-0-674-02119-8.